[Updated at 11:56 a.m.] Nicolas Mahut sat his prize down and took a big breath as the Wimbledon crowd applauded for him. After the match was immediately over, Mahut buried his head in his towel, frustrated with the loss. Still, Mahut acted like a champion, speaking on court after the match. "It was amazing to think of you guys you [the crowd] you were completely fantastic and John deserves to win it's so unbelievable," Mahut said. "He's a champion. He was - it really was an honor to play - we played the greatest match ever in the greatest place ever." Mahut was in a tough position, always being down to Isner's serve and trying to come back. Asked about it, Mahut said that wasn't part of his mindset. "It was not thinking about [that] I was just thinking about winning the game I was playing ... again and again," he said. "It was very long but I think we both enjoy[ed] it." [Updated at 11:53 a.m.] After the match ended, John Isner, was asked "The world's press, the world's media is watching, how do you feel?" "[I] got a little bit tired but when you come out and play a match like this, in an atmosphere like this you don't feel tired...this crowd was fantastic," Isner said. Asked about his opponent Nicholas Mahut, who now has the second most aces ever in a tennis match, Isner said it was an "honor" to play him. "What more can you say the guy's an absolute warrior," Isner said. "It stinks that someone had to lose." [Updated at 11:51 a.m] Eleven hours and five minutes - and three days after their match first started - it is finally over. The All-England Club said they decided to reward special mementos to the umpire and two players "in recognition of this quite extraordinary, unbelievable match." [Updated at 11:47 a.m.] The match that kept on going - finally came to an end. 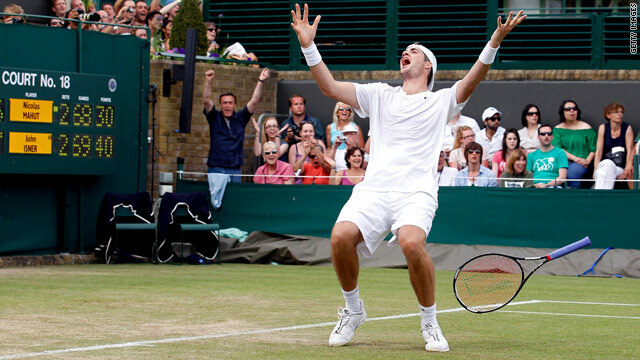 John Isner put a three-day match to rest with a final shot that gave him the 70-68 tiebreaker win in the fifth set. Nicolas Mahut, Isner's challenger, left the court immediately. He shook his head when stopped. [Posted at 9:56 a.m.] Will the third time be the charm for John Isner and Nicolas Mahut? Not the third set, or their third time meeting, but their third day of play at Wimbledon. It's been a match that has lasted 10 hours and been stopped twice due to darkness, and the fifth set has lasted 118 games by itself. The two players, fairly unknown to many who aren't avid tennis watchers, have attracted a huge amount of attention due to their ongoing match. It seems to be a feat many can't believe is still going on. "I thought I was tired. I’m tired of watching this," John McEnroe said at the beginning of the game to ESPNU, which is airing the match. "I’m quite proud of this. It's beyond heroic. It’s herculean. What they are doing - their will is unbelievable. I had to come pay my respects to both of them. Neither one is giving in." Isner's coach, Craig Boynton, told ESPNU that to win the match Isner needed to use his strength wisely and wait for the right opportunities. Asked if the fact that Isner was still standing was a testament to his strength, Boynton said: "I don't think anyone trains for this. Its sheer will and determination." The match absolutely eclipses any of the long classic tennis matches we've seen - like last year's Wimbledon final between Roger Federer and Andy Roddick that went to a dramatic 16-14 end. That game had the stars, but these guys have clear heart and endurance, so much so that SI.com's Bruce Jenkins likens the Federer-Roddick finale to now looking "rather paltry." Indeed, as Jenkins argues, the score in this match seems a whole lot more like the score at "halftime of an NBA game." - The length of the longest previous game came in 2004 at the French Open. Total length: six hours and 33 minutes. Isner and Mahut beat that in the ongoing fifth set alone at seven hours. - As an extreme tennis watcher friend of mine explained Wednesday night - if you were able to break up the long fifth set into 13-game virtual sets, the Isner-Mahut match was ended Wednesday one game into the 14th set. - The pair have a total combined 193 aces: Isner with 98 and Mahut with 95. The previous Wimbledon ace record was 51. SI.com's Jon Wertheim tried to put the match in historical perspective. "There was a doubles match at Wimbledon in 2007 where Brazil's Marcelo Meloand Andre Sa won 28-26 in the fifth set and everybody sort of giggled and made jokes about these two little-known players from Brazil having their day in the sun. Well, this match's fifth set will more than double that." "It makes me proud to be a tennis player," said John McEnroe, who was handling the BBC broadcast of the match said at one point. "It looks like Isner is about to fall over." There's been debate on the Web between those who argue it's unfair the match was suspended again due to darkness and those who want the two to be able to continue to duke it out without any stoppage. "I love this," Roger Federer said, according to an ESPN article. "I'm sure they don't love this, but in some ways this is unheard of in our game. I don't know if I was laughing or crying." Some wondered how much these guys will have left in the tank when they take to the court again - though they were able to get another night's sleep. It seems like that was an option Isner was hoping he wouldn't have to endure. According to The New York Times, Mahut approached the umpire and said he couldn't see - and Isner wasn't thrilled. “We couldn’t agree to play,” Isner told the Times. “So they canceled." Despite the momentary frustration, the match has been a momentous one for the sport - perhaps another chance to draw fans in - especially when they are playing in the wake of a World Cup that suddenly has U.S. fans paying big attention. Isner's name was thrown into the Twitterverse, Facebook posts and Web searches - at times eclipsing the big news of the day of a U.S. soccer win and Gen. Stanley McChrystal's resignation. "On balance, it is a good thing," SI.com's Wertheim said, after fearing at first there should be a system change and arguing the match was getting a bit ridiculous. "It's a World Cup day and everyone wants to talk about tennis." damn this match was sickkkkkkkkkkkk. I haven't seen a better fought match in recent sports history. I found this website started by a kid out in California who was so inspired by the fighting spirit that he started a movement to fight poverty out in Los Angeles. http://www.isnermahut.com. I think that's pretty clever. When I was a kid, NBC used to carry Wimbledon. I could imagine the housewives screaming that their soap operas weren't on for two MORE days because a match took three days to play. Kudos to the players on the endurance! All I can say is that I can not wait for the NFL to come back to TV. Then we don't have to watch all these pansy foreign wimp sports. Stizzle........ and which cute LITTLE state might ya'll be from boy? American sports are stupid ! I can only think one thing: OH, GOODNESS, THE CHAFING, THREE DAYS OF CHAFING! Perhaps the two ought to get together and make an advert for vaseline or baby powder...! There is NOTHING remarkable about this, other than 2 mediocre players who could not get the job done....... both EQUALLY bad.... otherwise, these type of scores would be COMMON-PLACE. In order to prevent debacles like this, after a set number of games (tied) there needs to be an abbreviated scoring system in place to facilitate a QUICK final outcome. ie.... start the final set at 6-6, and the FIRST person to 7 wins set and match. So I went to Wimbledon and a cricket game broke out. If that's tennis between not so famous. Gosh! what is the future of tennis, then. ok so forget baseball, bad example. plus, it can get quite boring. but think about hockey, football, etc...sudden death, overtime, whatever...there are ways to avoid three day games.